Worms working hard to create dirt from garbage! When you see links in my posts, assume they are affiliate links. If you click and make a purchase, I will receive a small commission. I am an affiliate with Amazon and other resources. Squirms of worms! These active worms create good dirt for my plants’ nutrition. They are vigorous today, busily turning the kitchen garbage and my junk mail into fabulous worm castings! The little red yellowtails are wriggling themselves through rot nutrition, doing their dirt making best. Since we gave the old chickens away, the kitchen scrap scene has exploded! The worms have the opportunity for better rot variety than coffee grounds, tea bags and paper towels. Maybe a few bread crumbs and veggie bits, but the greater share of their decomposing microbe feast was the coffee grounds/filters and other paper. 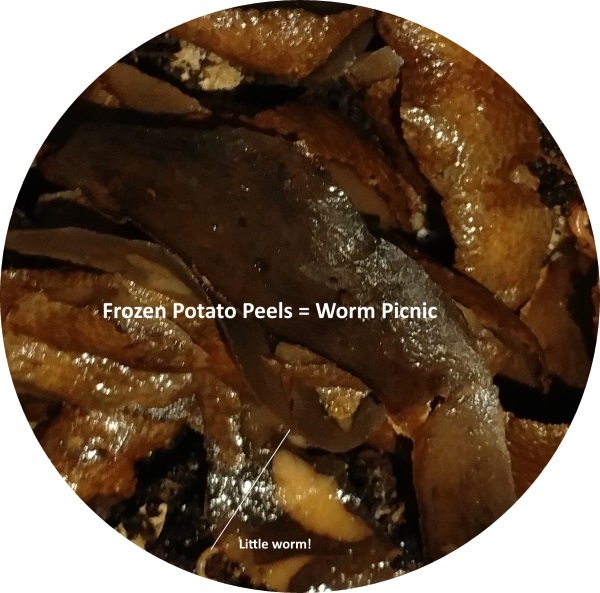 Worms create good dirt from Vegetable peelings! Peelings from potatoes, carrots and other root crops are ‘alive’ when fresh and take a terrible time to decompose. They won’t be food for the worms until they break down. Freezing or cooking them (microwave cooking works) gets them to the rot stage right away. I haven’t had such speedy worm bins for years. The extra food includes better kitchen scraps, the good old coffee grounds and tea bags, plus extra shredded newspaper and a paper bowl! Why the bowl? It is set on its edge with only part of the rim accessing the food/bedding. I can watch that bowl gradually shrink as the edge rots and becomes worm food! When there were only boring coffee grounds, I usually fed on top of the bin, letting each layer cover the last for increased rot. With the extra kitchen garbage, I am burying new food. Buried scraps have heat reaction as they rot which helps keep the worms close to their highest performance. My goal is twofold. One, help garbage rot faster so the worms can eat, grow, get married and make babies. Two, make the bins less tempting for mice who might get in to check out the menu. With the addition of heat in the basement, the worms’ general environment is warmer. There is greater risk of drying the bins out in the heat, so we watch to be sure we bring enough moisture in with new food sources or adding some water. I like to pour extra water over the shredded newspaper cover. The paper is dampened for more effective cover and the water is spread out over the bedding. Worms thrive in the wetter (not soupy wet) bedding and suffer when the bedding becomes too dry. I have always had the advantage of a dry, safe basement to shelter my worms. That permits me to use common plastic storage tubs as bins. A grander operation such as the tower pictured below offers users a more attractive and manageable vermi-composting project. The worms can move from one layer of the tower to the next. They will migrate when they’ve processed the organic material in the first layer. Clear, black, rich compost is left in that first layer while the second is well inhabited by happy worms. Are you able to compost? Do you ever think about ways to compost in your home or yard? Worms are quiet pets that will create dirt for you while composting organic things from food scraps to junk mail! Carefully choosing the organic material controls any possible odors at the bins. In closing, if you see links in my posts, assume they are affiliate links. If you click and make a purchase, I will receive a small commission. I am an affiliate with Amazon and other resources. Previous Post: « Hummus — Learn Why You Love It! 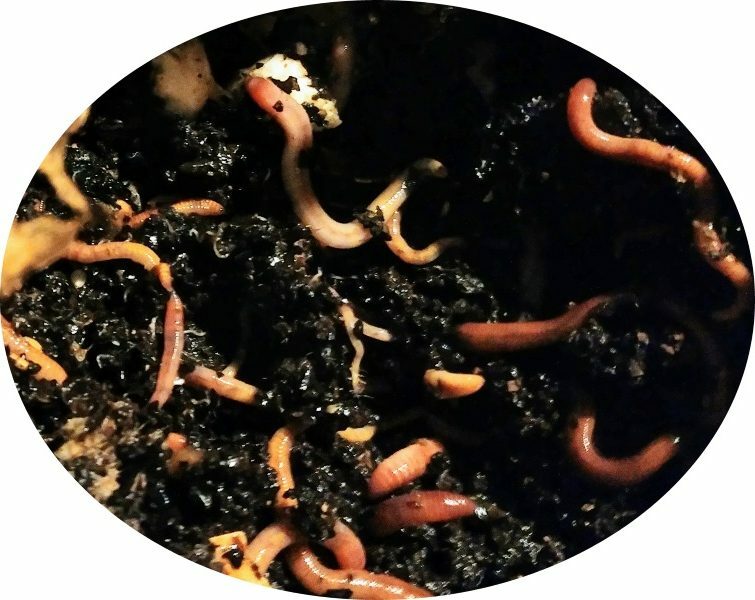 We’re new to using worms in our compost – can’t wait to try them though! Red wigglers arriving on Thursday. Thanks for the great information here! I don’t have a worm bed per se, but I’ve been composting for many many years and I love my worms!